It’s been a while since I’ve posted anything on Perry the Corpse Flower, but exciting news is now being made! Readers of this blog might remember the surprising news that Perry had been self-pollinated by the myriad houseflies that visited during her/his flowering in July 2010, drawn in by Perry’s olfactory magnificence. Since the male and female flowers within an Amorphpophallus titanum inflorescnce are supposed to be fertile at different times, we were not expecting pollination to happen…but it did. For earlier posts on production of and photos of earlier stages of growth of Perry’s brilliant orange berries, click here (Perry’s Berries), here (Perry’s Berries II), and here (Perry Christmas!). 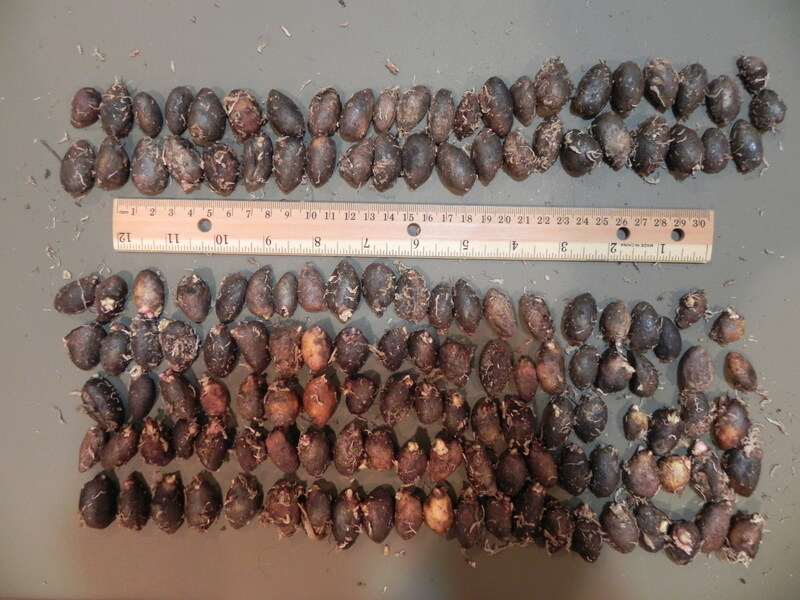 The berries were ripe after about six months, and were harvested in early February (the first photo above shows the ripened, collapsing infructescense – click on the thumbnail for a larger view). Inside each berry was one seed, and the seeds were cleaned. 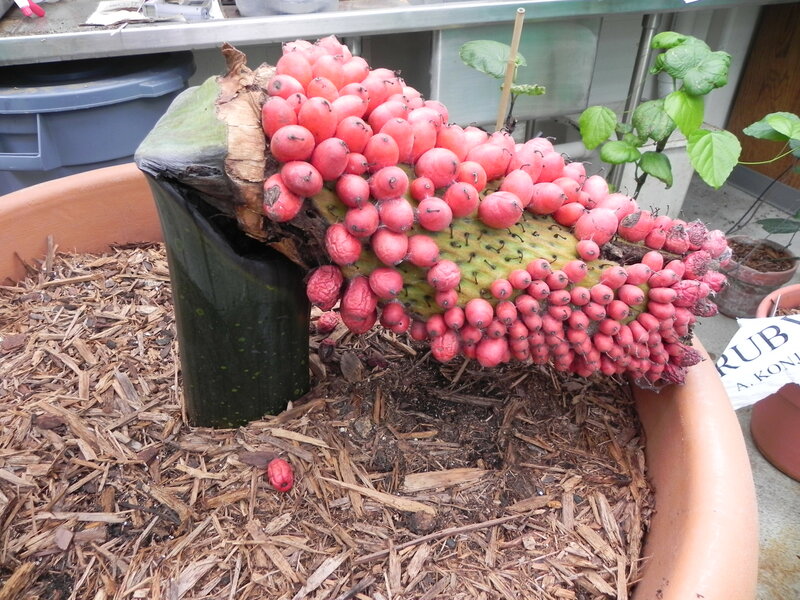 At this point, we didn’t have high expectations, since seeds from this kind of inadvertent self-pollination of Amorphophallus titanum have proven to be sterile in other cases. Perry fooled us again. We thought that many of the seeds looked perfectly viable, so planted all of them. I planted one batch in potting soil (146 seeds, second photo above), and Philip planted another batch (47 seeds, third photo above) in Chilean sphagnum moss. About six weeks later: GERMINATION!! Four shoots appeared in my batch of seeds (the shoots now number 22 – see the fourth photo above). The first of these seeds sprouted a bit earlier than those of Philip’s batch, probably because I had a seed-heating mat under mine. 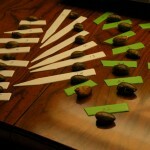 On the other hand, Philip’s batch of seeds currently has a much higher germination rate (25 of 47) than my batch. 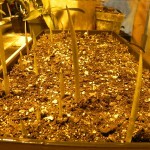 As of this writing, we have a total of nearly 50 seedlings! If you’ve been wondering about the title of this post, it comes from a movie based on a Stephen King novel – there’s really not a good analogy there, but the opportunity for alliteration was irresistible. 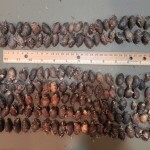 Another component is the fact that a tuber such as Perry’s, with only one growing point, is called a corm (a more familiar example of a corm plant is Gladiolus). Click here for the first Children of the Corm post from 2007. That post had to do with collection of pollen from Perry. Hi Cindy, and Hongera to you, as well! We are, to say the least, highly pleased at this unexpected outcome. 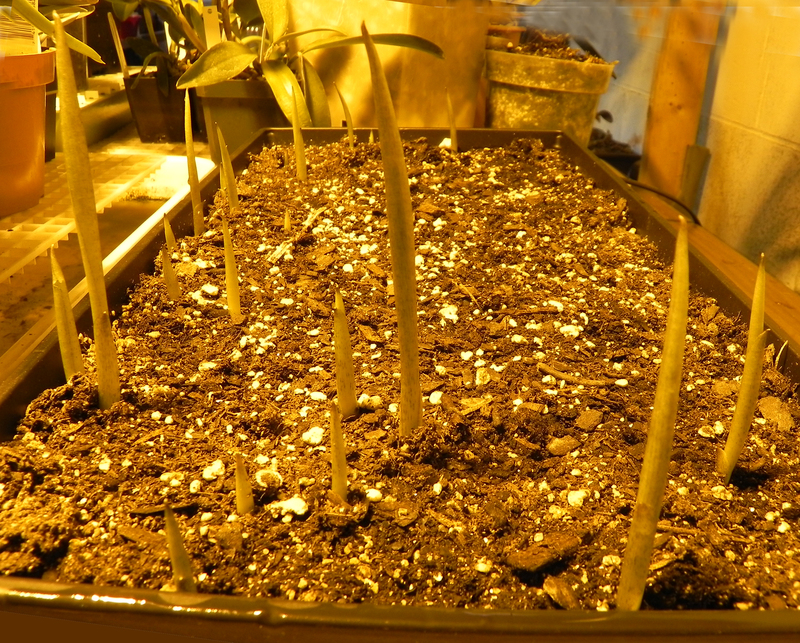 I checked the seedlings about an hour ago, and there are no new ones – but, on the other hand, a couple of the larger ones are beginning to open leaves (leaf of each one has been contained in a sheath until now). Just in time for several months outside, once they’ve been transplanted to individual or community pots. And yes, plants R grand!! That is very fascinating news! I look forward to hearing about the adventures of Perry’s offspring! Thanks, Pamela. 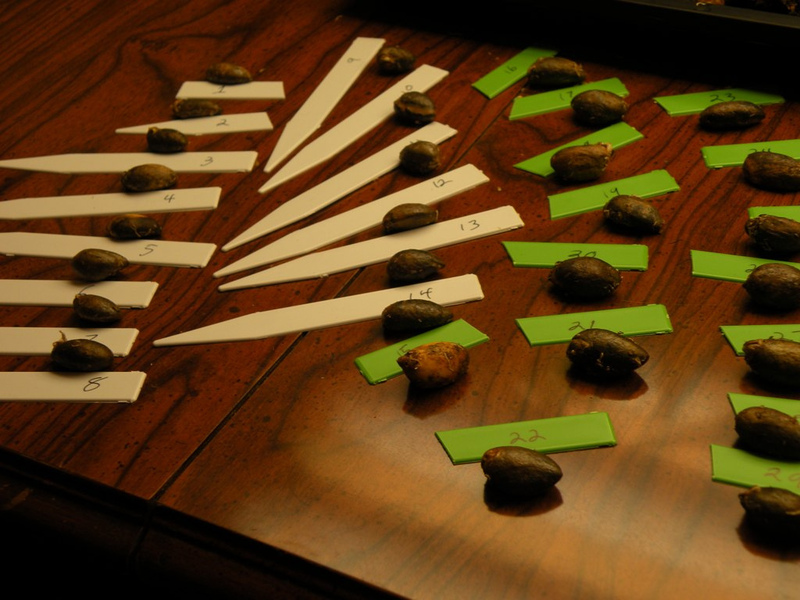 As more seeds germinate, and the plants get larger, I’ll be making more blog posts. I’m thinking about transplanting some of the larger seedlings to community pots soon. Congratulations Brian! I think that might be the first recorded successful self-pollination. Next step perhaps try to replicate it manually on your next blooming titanum; find that sweet spot between male & female flowers? Pamela – it is indeed a titanic forest. I think that you’ll like my next post…we’re thinking along the same lines. We’re planning to repot Perry in July, so stay tuned for photos of that operation. That’s great! And in the meantime, Bob, too, is about to bloom! 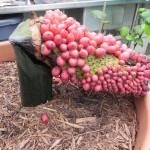 Here’s an explanation of the “BOB” names – we donated two plants of Amorphophallus titanum to the Marjorie McNeely Conservatory at Como Park, and the first one to bloom was named “BOB” after me. The upcoming blooming is of the second plant, also named for me: “BOB,too” with no space after the comma so as to let people know that the words are associated. The same sort of naming was done for the Lassie TV series – there were many Lassies, one after another over the lifetime of the show.